A Michelada (Spanish pronunciation: [mitʃeˈlaða]) is a Mexican cerveza preparada made with beer, lime juice, assorted sauces (often chili-based), spices, tomato juice, and chili peppers. It is served in a chilled, salt-rimmed glass. There are numerous variations of this beverage throughout Mexico and Latin America. In Mexico City, the most common form is prepared with beer, lime, salt, and particular hot sauces or chilli slices. There are several other optional ingredients, such as Maggi sauce, soy sauce, Tajín, Worcestershire sauce, chamoy powder, serrano peppers, Camaronazo (a shrimp based tomato juice), Clamato, or slices of orange. There are two popular versions of the origin and etymology of the michelada. One concerns a Michel Ésper at Club Deportivo Potosino in San Luis Potosí, Mexico. In the 1960s, Ésper began to ask for his beer with lime, salt, ice, and a straw, in a special cup called "chabela", as if it were a beer lemonade (limonada). The members of the club started asking for beer as "Michel's lemonade", with the name shortening over time to Michelada. As time went by, other sauces were added to the original recipe. Today, it contains the same ingredients as a chelada but contains ice and chili powder on the rim. 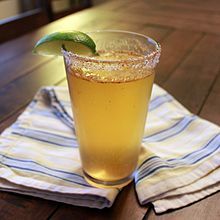 In the 2010s, major U.S. beer producers began marketing cervezas preparadas, illustrating the wide variety of recipes in the chelada/michelada category and meeting its popularity among the country's Latin American population. For example, Miller Brewing Company produces Miller Chill, a "Chelada-style light lager with a hint of salt and lime". Anheuser-Busch makes Budweiser Chelada and Bud Light Chelada, a combination of lager, clamato, lime juice, and salt. As of 2012, Tecate now offers a michelada flavored with lime and spices. In 2015, Cervecería Centro Americana, a Guatemalan Brewery, released a Michelada under the trade name Dorada Draft Michelada Chiltepe. The beverage is spiced with chipotle peppers, the most widely used peppers in the region. ^ Maggie Savarino (2009-07-15). "Search & Distill: Michelada Is Your Standby Beer, Only Better - Page 1 - Food - Seattle". Seattle Weekly. Archived from the original on 2011-01-04. Retrieved 2011-01-25. ^ "Mexican companies pushing spicy beer mixes in US mkt". FindArticles.com. Business Journals, Inc. 2005-12-19. Archived from the original on 2011-11-25. Retrieved 2011-01-25. ^ "Los Angeles Times". Articles.latimes.com. 2003-04-27. Retrieved 2011-01-25. ^ "Micheladas: Beer with a Mexican Flavor". www.mexico.mx. Retrieved 15 February 2018. ^ "Flash Detect: Miller Chill: Light Lime Beer". Miller Chill. Archived from the original on 2011-11-25. Retrieved 2011-01-25. ^ "Budweiser Chelada". Ratebeer.com. Retrieved 2011-01-25. ^ "Tecate Michelada". Beeradvocate.com. Retrieved 2016-04-18. ^ "Michelada Chiltepe: Una cerveza para picar". Soy502.com. Retrieved 2016-04-18. 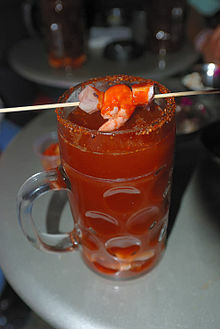 Wikimedia Commons has media related to Michelada.